Tangy, hearty, and easy! 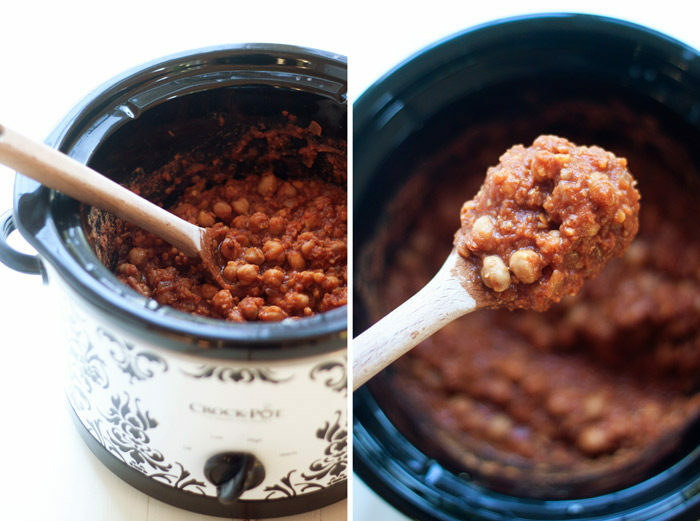 Chickpeas and red lentils cook up thick and rich in a tomato-BBQ base. Stormy weather has hit Washington state. Wind, rain, and no sign of letting up – in fact, quite the opposite. Eek! I am a storm wimp. When I was a kid, storms were just adventures, but now they’re only about 10% fascinating and 90% scary. I guess the older you get, the more you see, and then you realize that bad things actually can and do happen. At least that’s my theory. Or maybe I’ve just become a class-A weenie with age. Fall came fast here in the Pacific Northwest, and this storm has pretty much sealed the deal. I’m in full-on cozy-making mode, obsessing over plaid throws and sweater rugs and Crock Pot meals. 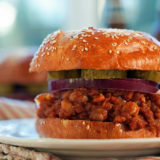 Segue to these Slow Cooker BBQ Chickpea Sloppy Joes! Chickpeas add “meatiness” and stick-to-the-ribbishness while the red lentils help thicken things up enough to pile it on. 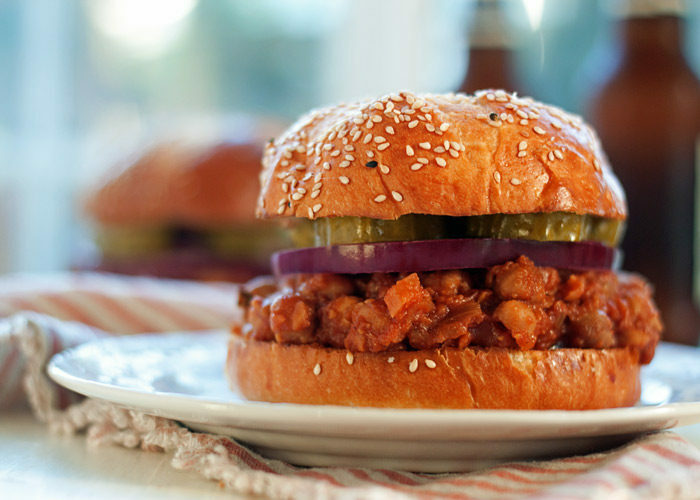 And with what’s basically a BBQ sauce base, these vegan sloppy joes are tangy and just a little different. In a good way, I think. Add all ingredients to the slow cooker. Cook on low for 8 hours or on high 5-6 hours, until the lentils are cooked through and the mixture thickens. Open the slow cooker and, using a potato masher, mash about 1/3 of the filling. Give it a good stir, replace the lid, and let it cook for another 30 minutes or so until thickened. Meanwhile, toast the buns. Brush insides with olive oil and place cut-side-up under the broiler in your oven. Broil 30 – 60 seconds until golden. Place buns on plate and spoon filling over the top. Add toppings if desired. Serve. Leftover filling keeps well in an airtight container in the refrigerator for 2-3 days. Use gluten-free buns or you can go the bunless route – the filling is also great over brown rice or spaghetti squash. Can you use coconut aminos instead of worecestersauce? Also, can u omit the brown sugar or is it a must? Thanks. Excited to try this dish! Do you have any nutritional info on this recipe? Thank you for this recipe! I am obsessed with it, and have made it once a week or so for the last month. 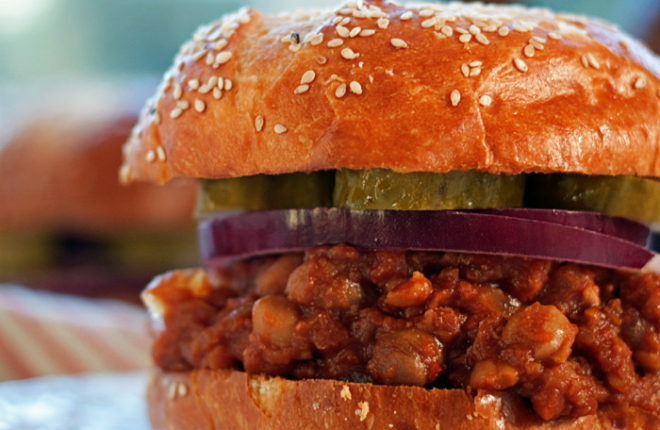 I love it on the Wheat Montana premium BBQ buns, available at most PCCs. 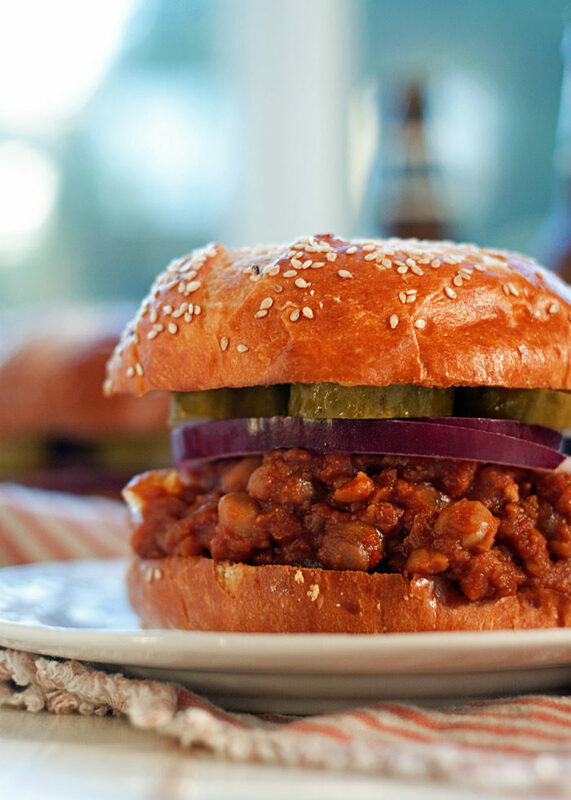 They have a crunchy wheat and seed topping and a more substantial texture that really stands up beautifully to these sloppy joes. The only addition I’ve made is a couple stalks of chopped celery and a chopped green pepper. So delicious!!! I’m so glad you like it! I’ll have to check out those buns. Yum! Can you use a bottled BBQ sauce instead of essentially making your own? And, if that’s a no, what tomato sauce do you use? Thank you! I haven’t tried that, but I’m sure it will work! I like Muir Glen brand tomato sauce. Hi Karen, If I’m trying to reduce my sugar intake, could I reduce the brown sugar and still be successful? Can these be cooked in an instapot? Ooh, probably! I love this idea. I’ll try it and report back. Could any left overs be frozen and heated up later? Yes, it freezes really well! I NEVER leave reviews on recipes but this is one of my favorite vegan meals of all time. So easy to make and so delicious. Thank you! I really appreciate the review! Thank you so much Mary Pat. I’m so glad you like this one as much as we do! This was pretty good! A little too sweet for my taste but my family enjoyed it! I am cooking some of this now to put ontop of baked potatoes. I didn’t have the W sauce so I replaced it with barbecue sauce and a little extra liquid. It’s really good and I can’t wait for it to be fully cooked! 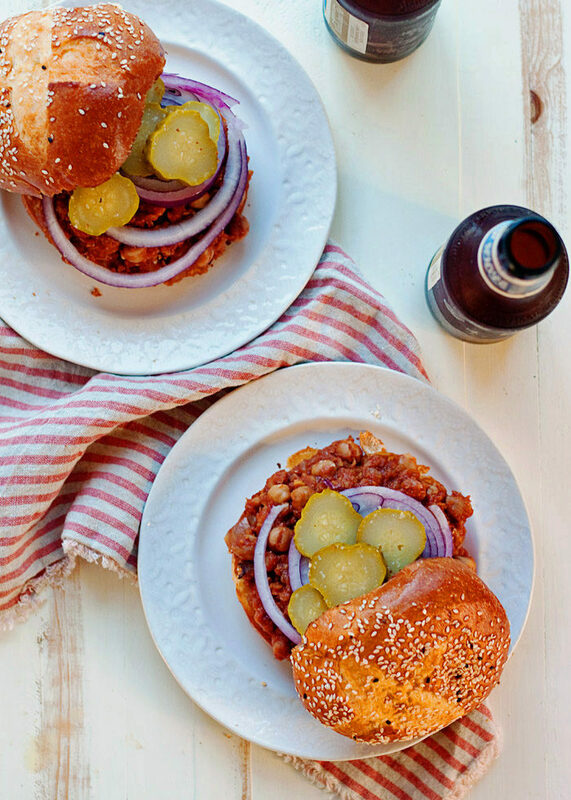 I thought about just adding barbecue sauce to the chickpeas and lentils but the sauce created in this recipe tastes way better and it’s worth the extra effort. Hats off to you my friend, you really know what you’re doing!